Wounded Times: Police saved the birthday of duo-veterans' son! Police saved the birthday of duo-veterans' son! 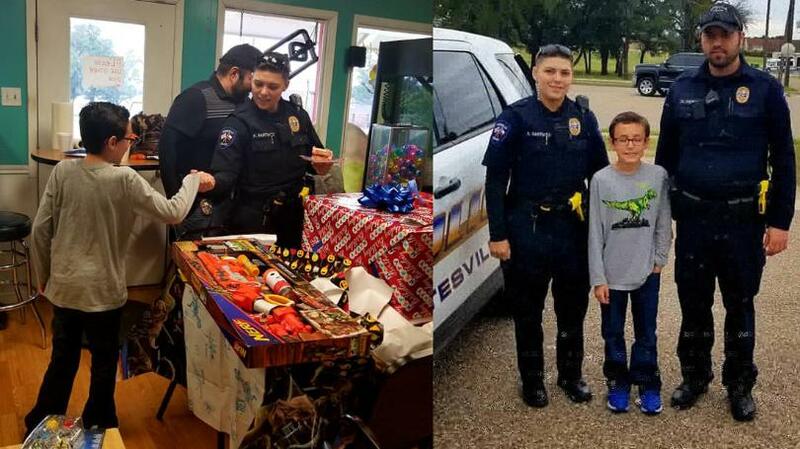 GATESVILLE, Texas (KWTX) When classmates failed to show up for a pizza party celebrating the birthday of the son of two Gatesville Army veterans, the youngster’s mother called police, thinking that officers would appreciate the unneeded pizzas and the cops responded, bearing goodwill and an armload of gifts. Kaleb Jansen and his parents, Brian and Tara, both former military police officers, moved to Gatesville from Colorado six months ago. Tara spent five years as an MP and Brian served for 24 years, spending time at Fort Hood and deploying several times to Iraq. Kaleb invited his new classmates to his 11th birthday party over the weekend at Studebakers Pizza in Gatesville, but his parents’ hearts sank when not one person walked through the door. “It’s so hard as parents to see your little one sitting there just waiting for friends,” Tara said.